According to JD Power and Associates’ 2016 Credit Card Satisfaction Study, customer satisfaction is up for the sixth year in a row and is at an all-time high for the nine years they have been conducting the study. Using a 1000 point index, the study measures customer satisfaction with credit cards by examining six key factors: interaction; credit card terms; billing and payment process; rewards; benefits and services; and problem resolution. The 2015 study found that at least one in five credit card customers are carrying the wrong card. Customers with the wrong card are overall less satisfied with their card than those who have a card more appropriate for them. Overall satisfaction is at a record high of 796, surpassing the previous high of 790 in the 2015 study. Nevertheless, the Consumer Financial Protection Bureau reported 14,728 consumer complaints relating to credit cards in 2016. 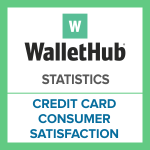 Discover ranks highest in customer satisfaction with credit card issuers for a third consecutive year, having tied for the highest rank in 2014. All seven issuers experienced an overall increase in customer satisfaction over the past four years. Capital One experienced the greatest increase gaining 65 points (8.8%) from 2012 to 2016. *Note: Capital One Financial Corp. agreed to acquire HSBC's U.S. credit card business in August, 2011. National City Corp. was purchased by PNC Financial Services in December 2008. In September 2008, Washington Mutual Bank was placed into receivership. JPMorgan Chase acquired the majority of the banking operations as well as the credit card business line of Washington Mutual from the receivership of the Federal Deposit Insurance Corporation. The following chart lists the total number of consumer complaints related to credit cards received by the Consumer Financial Protection Bureau by issuer from February 2012, through September, 2016.